Specification and optics same as Startravel-80 but comes with 45º Erect Image Diagonal, and supplied without Equatorial Mount and Tripod. Complete with tube rings. This refractor telescope could be a good choice for a guidescope / guider scope / guiding scope as well. 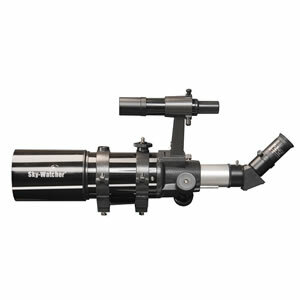 An ideal instrument for the wide-field observation of Deep-Sky objects, such as Nebulae, Star Fields & Clusters and Galaxies. A useful telescope for astrophotography and also for daytime terrestrial use.